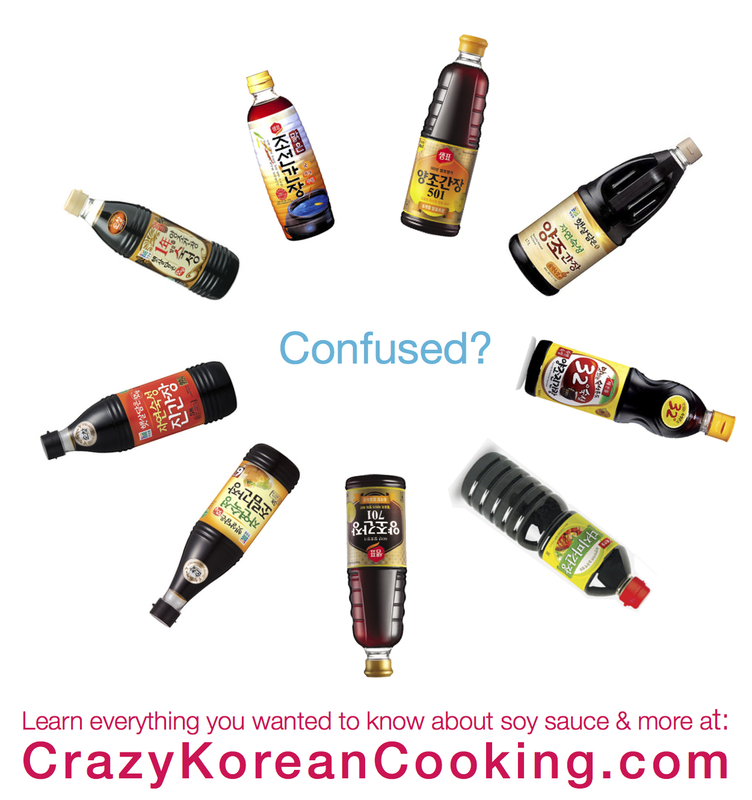 Confused about Korean soy sauces? Here is everything you need to know about soy sauce in Korean cooking. What are the types of Korean soy sauces and how are they different? There are mainly two major types of soy sauce, and they are categorized by use: regular soy sauce and soy sauce for soup (Guk-Gan-Jang or Josean Gajang). The regular soy sauce is widely used in Korea and very similar to the soy sauce you see in Japan or North America. Soy sauce for soup (Guk-Gan-Jang or Josean Ganjang), however, is unique to Korean cooking. As the name suggests, soy sauce for soup is mainly used for soup today. But it is also used for “namul” (korean vegetable side dishes). Since it’s much saltier and lighter in color than regular soy sauce, you can use a small amount to season your soup while keeping the soup color nice and clear. Most Koreans today use both whe-ganjang (regular soy sauce) and joseon ganjang (traditional Korean soy sauce) for cooking. Traditionally, however, all Korean cooking was done with Joseon Ganjang only. So, joseon ganjang can also be used for marinating and braising. In fact, it will give a deeper and cleaner flavor than Whe-Ganjang. Just remember to use smaller amounts since it is richer and saltier than whe-ganjang. In addition to the two main soy sauces, another variation is called Mat-Gan-Jang (meaning “tasty soy sauce”). Mat-Gan-Jang is usually made by boiling regular soy sauce with different combinations of flavorful ingredients such as garlic, rice wine, sugar, lemon, mushroom or kelp, and then it’s saved for cooking various dishes. Yang-Jo-Gan-Jang is brewed naturally using soybean, defatted soybean, and wheat. The quality goes up depending on how much soybean has been used. The fermentation takes usually 6 months to a year. Jin-Gan-Jang is a mix of chemically produced soy sauce and naturally brewed Yan-Jo-Gan-Jang. Some Koreans purchase Jin-Gan-Jang because it’s cheaper or because they are accustomed to the taste from their childhood. Jin-Gan-Jang became a big hit due to Sempyo’s (Korea’s largest soy sauce manufacturer) marketing campaign many years ago. The higher the amount of Yan-Jo-Gan-Jang (naturally brewed soy sauce), the higher the price. Both are used for the same purposes: stir-frying, braising, marinating and grilling, as well as for dipping sauce. However, Yang-Jo-Gan-Jang is definitely better in quality and taste if you can spend a few more dollars. Some Koreans use Jin-Gan-Jang for braising and marinating which both require a greater amount and a longer cooking process, and they use Yang-Jo-Gan-Jang for dipping sauce, where people can enjoy the purer and richer flavors of soy sauce. So, which should I buy for Korean cooking? If you want to buy both types of ganging, here is our recommendation. For regular soy sauce, we recommend Yan-Jo-Gan-Jang over Jin-Gan-Jang. Any brand of Yang-Jo-Gan-Jang should be okay, but make sure it’s 100% Yang-Jo-Gan-Jang. Also, if you read the label on the back, there is something called the TN number which indicates how much actual soybean protein is contained. The higher the TN number, the more premium the soy sauce is. (A TN number of 1% is average, 1.3% premium, and 1.5 - 1.8% super premium.) Also, try not to buy ones with additives such as para-hydroxyethl benzoate (synthetic preservatives), corn syrup and caramel coloring. You can also use Japanese soy sauce for regular soy sauce. If you’d like a specific recommendation, we recommend Sempyo Naturally Brewed Soy Sauce 501S or 701S (샘표 양조간장 501S/701S). For soy sauce for soup (Guk-Gan-Jang or Joseon Ganjang), we recommend Wholly Ganjang which is made by a Korean jang artisan who has dedicated the past 20 years of his life in the art of fermentation. 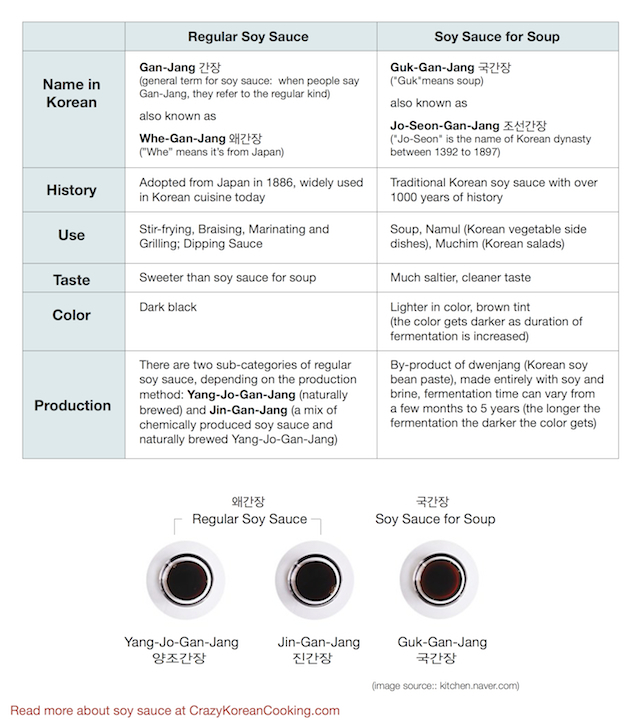 Wholly Ganjang is gluten free and chemical free, and made by a natural fermentation method. It has complexity and depth most store bought ganjang doesn’t have. You can use Wholly Ganjang for all types of cooking, just remember to use less than regular ganging since it is richer and saltier. You can purchase Wholly Ganjang here. How should I store soy sauce? How long does it last? You can keep soy sauce at room temperature, away from direct sunlight or heat. But, they say it’s better to keep it in the fridge once opened. Usually soy sauce has a two-year expiration period, but for ideal flavor it’s good to consume within two months after opening. Sometimes you may see foam on top especially for Soy Sauce for Soup. This is usually not a sign that it’s gone bad as the reaction of amino acids can produce foam. Can I just use regular soy sauce for everything? Sometimes moms use just regular soy sauce or a mix of regular soy sauce and Guk-Gan-Jang for namul (korean vegetable side dishes). But for soup it’s better NOT to use regular soy sauce. You can season soup with salt or fish sauce if you can’t find soy sauce for soup. Is soy sauce necessary? Can I use just salt to season? Salt simply gives a salty taste. Soy sauce gives saltiness along with a hint of sweetness and other flavors that come from soybean and fermentation. Why is soy sauce black when soybeans are not? In making soy sauce, protein from soybeans breaks down into amino acids, and this reaction results in a black colored substance. hey thanks for the great article! I didn't know the difference between 양조간장 and 진간장 but now i know :) by the way, 외간장 should be written as 왜간장, since 왜- means that it is from Japan. Thanks for the correction. You are right. We will fix the typo. THanks again!